A peek into my past. But II’ll only divulge it’s SDSU. That’s me — yes, it is — with Beowulf and Sabrina. Sabrina (best Border Collie EVER) is sitting under my chair and my part-wolf, part Malamute rescue puppy — I rescued him when he was three weeks old and bottle fed him, bringing him everywhere in a front pack baby carrier. He’s a year old here — circa “I’m not gonna tell ya” — and needed my attention. Yes, they both sat there like well behaved children when I walked up to the podium for my diploma. 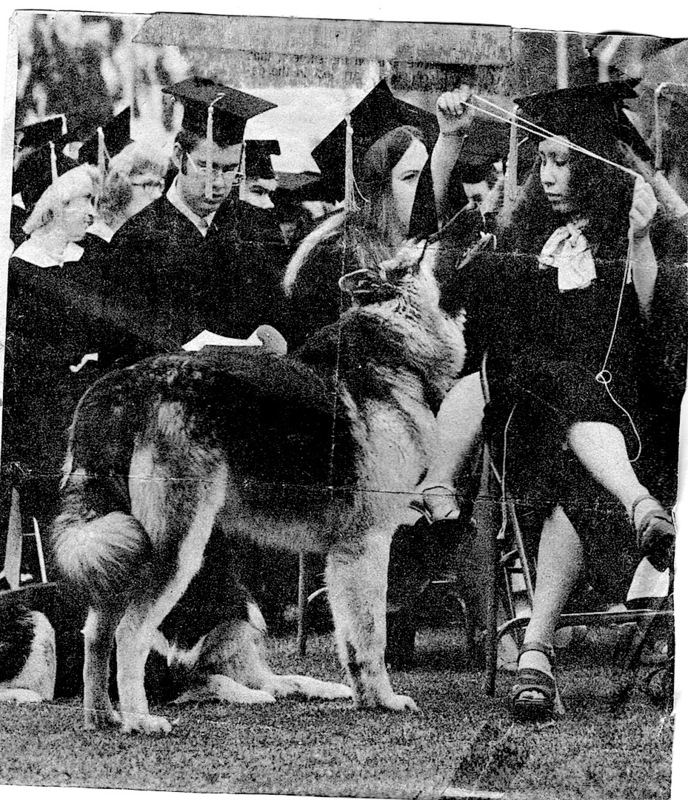 This entry was posted in Animals:Defend/Protect, My Enchanted Life, Photography, Princess Rosebud and tagged #TBT, #ThrowbackThursday, Border Collie, College Graduation, I had a wolfdog, Old school, Photography, rescue dog, SDSU, Throwback Thursday by Enchanted Seashells by Princess Rosebud. Bookmark the permalink. I love that you were able to include your darling dogs in your ceremony! My babies went everywhere with me. Umm, I was the last one, they kinda got too much attention with the press and all, and after that, no dogs 😦 But who cares, cos I did it! You got to take pets to your graduation ceremony. How interesting, and odd at the same time.